Peak Performer’s Life: Networking is a Game Changer! 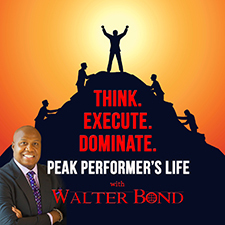 This week on Peak Performer’s Life, Walter Bond continues his series on networking and discusses how networking can be the game changer you’ve been looking for to advance your career and personal life. By using networking skills, you can elevate and focus your career through your relationships. Your success is determined by your ability to connect to and maintain your network. As part of his year-long series of motivational messages, Walter Bond discusses the importance of patience, solid investments, perseverance, and more. Check out the full message below. How has the power of networking affected your career and job search? Let us know in the comments section below. A former professional basketball player, Walter Bond’s NBA career included 153 games with the Dallas Mavericks, Utah Jazz, and Detroit Pistons. Now, Walter takes what he learned from his life on the court and translates it into motivational and educational messages for thriving businesses and careers. With entertaining and dynamic messages, Walter has spoken to companies and associations throughout the United States, Canada, Mexico, the Caribbean, and Europe. For more information about Walter Bond, visit WalterBond.com.